This past February I read a book written by a blogger friend of mine Terra Kelly. It was her first novel and she called it Catch Me. You can read my review here. The book ended up being the first of a series and I just finished book 2 titled Need You. This book is about another of the four brothers who make up the Winter's family. It is a light and easy read. Terra's books are mostly happy and upbeat. They are romance novels and require no brain power so you can just relax and lose yourself in the story. They are quick reads so they are perfect for that summer day at the beach when you need to keep one eye on the kids and one eye on the book. Terra is also a food blogger over at Cafe Terra so as an added bonus her books are filled with delicious foods and some of the recipes are even included. What more could you ask for out of a book!! This blog contains an affiliate link. Should you choose to link and purchase this item there is no cost to you and I am given a small stipend to help defray the costs of this blog. I have been telling all of you about our daughter and son in law's new business venture Petoskey and Pine for a few months now. I am so proud of them and the products they are providing. They make artisinal soaps, lip balms and candles. They are all handmade by just the two of them and they use only the finest ingredients that are fair trade and environmentally friendly. The results are spectacular!! The soaps are made with coconut oil and are silky and luxurious. They eliminate all the dry skin woes that many of us suffer during the cold Michigan winters. They have recently started a line that adds almond milk to the bar resulting in a soft, creamy feel makes you want your shower to never end. The lip balms are smooth, with no greasy feel to them at all. The "flavors" are bright and exciting. And the candles.....ooooohhhh the candles. They smell so luxurious and are made with soy wax to minimize the carbon footprint left by those candles made with parrafin wax. They also choose not to add any colorants to their candles because "they contain unknown chemicals and are not necessary". But you do not need to take my word for it....you can check out all these other bloggers who were provided products and see what they thought. Petoskey and Pine provided their choice of soap or candle as well as a lip balm for each requesting only for an honest review of their products. Trust me when I say that I would not have put these products out there without having faith that they were the ultimate in quality and value. I am so happy that Petoskey and Pine have given us an opportunity to share these great products with our readers. Three of you will be winners this week. 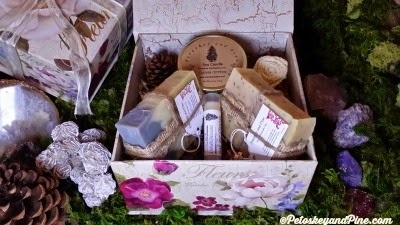 One lucky winner will be winning a gift box containing 2 soaps, a candle and a lip balm. The other 2 winners will receive a beautiful wooden soap dish containing a bar of soap all wrapped up and topped with a flower. Guess what time it is?? That's right...it is Reveal Day for Secret Recipe Club. 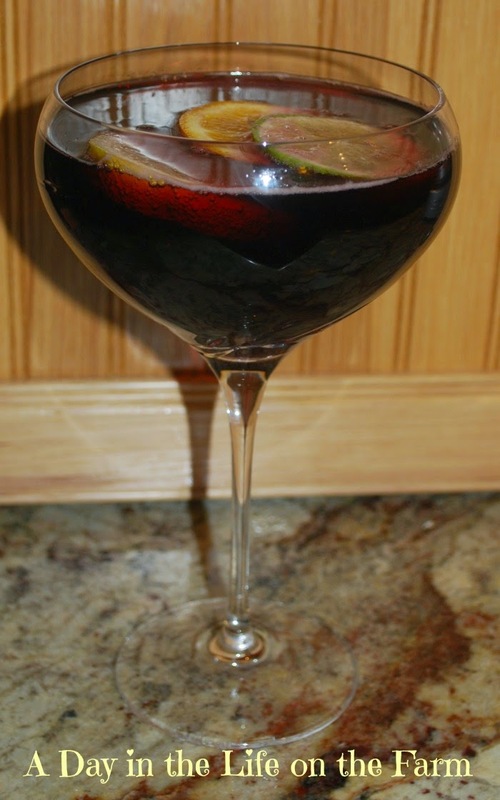 That means that today I am going to share with you the blog I was assigned, a little bit about the author and the blog content, and one of the recipes I found that I wanted to recreate. This month I was assigned Lauren of Sew You Think You Can Cook. Lauren is a fellow midwesterner living in Ohio which is neighbor to my home, Michigan. Lauren is much smarter than I though as is apparent by the fact tht she is an AeroSpace Engineer!! But, intelligence notwithstanding, Lauren and I have much in common. Lauren hopes to be a caterer one day as I was a caterer in the past. We both love to cook, quilt and blog and we both love Holiday decorations. I really enjoyed learning about Lauren and I think you will too. But that's just the first part of this assignment....after I learned a little bit about Lauren it was time to go into her recipe file and find just one recipe that I wanted to recreate for you this month. THAT is the hard part!! Finding just one recipe in the plethora of wonderful recipes that Lauren has to offer. I had seen Lauren's Oatmeal Pancakes back in January when we participated in Foodie Extravaganza, another fun group to which we belong but while looking for that recipe I found her recipe for Nalesniki (Polish Crepes), another thing that Lauren and I have in common....Polish heritage. However, Lauren was born Polish and I am Polish through marriage LOL. Her recipe was very similar to mine. Breakfast was just one of many categories in Lauren's recipe index though so I couldn't stop there. I went to Beverages where I earmarked Sparkling Strawberry Lemonade to serve as soon as Michigan strawberries are in season, usually early June. Then there were Snacks and Appetizers to look at. When I was done there, it was time to go into Soups and Salads, followed by Entrees in Meatless, Seafood and Meat categories before finishing up with Sides and Desserts. 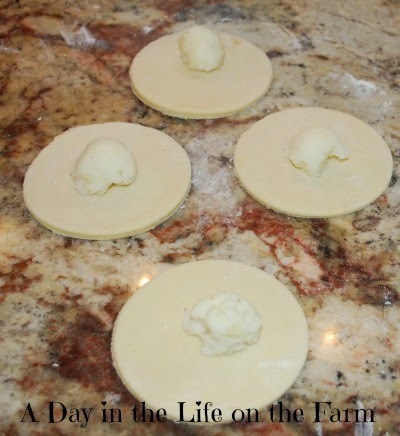 What impressed me most when going through Lauren's blog were all the recipes of her Busia's that she shared. Busia is grandmother in Polish. 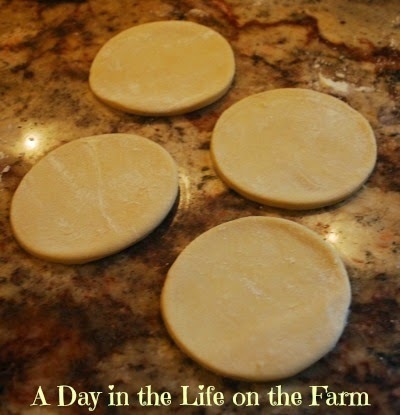 My husband called his Busia, Bacci and his Mom has shared many of Bacci's recipes with me. In fact, I just shared the recipe for Bacci Bread earlier this month. I finally settled on Lauren's recipe for Pierogi. 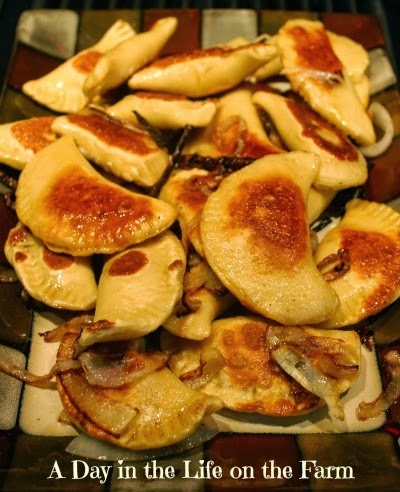 I have always wanted to make homemade Pierogi and this recipe was perfect! 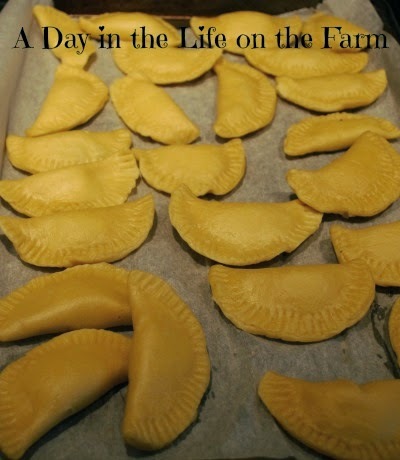 In the past, when I have served Pierogi, I have used premade Pierogi that I purchase from a Polish Bakery in the area and last year Frank made Lazy Pierogi when Ciocia (Aunt) was over teaching me to make Kruschiki . Needless to say, I was very excited when I found this recipe on Lauren's blog! I cheated a little bit by using my kitchen aid mixer for the middle section of the recipe but I did knead in the last cup of flour by hand and rolled out all the dough when assembling the pierogi. There is a reason that Eastern European women were so strong. I worked up a sweat making these delicious little dumplings even with cheating!! I want to thank you Laura for helping me to mark off another item from my bucket list. The pierogi were excellent. Frank thought they were better than those that I normally serve from the Polish Bakery. I will be making this recipe again and again, I am sure. I stayed pretty true to the recipe except that I used 2% milk and regular half and half instead of skim and fat free because that was what I had in the house. Oh and my eggs come from my chickens not the store so I just chose the largest one for the yolk and 3 others for the remainder of the eggs. After the dough was made, I left it in the refrigerator until the following afternoon. Then I rolled it out, a little at a time, and used a 3 1/2" round biscuit cutter. Place a dollop of filling of your choice on each round. I made half potato/cheddar and half sauerkraut. Fold in half and seal by pressing with fork. Then drop them in boiling salted water until the float to the surface, 10 minutes or so. You can now refrigerate or freeze them. When ready to serve, fry them up in butter and onions until browned and heated through. Serve with sour cream as a side dish or for a Meatless Monday meal as I did. Mashed potatoes that incorporated shredded cheddar cheese in the mashing process. Sauerkraut- you can find my recipe here (just delete the sausage). note: you will not need a ton of filling. I placed the remaining mashed potatoes in a casserole to be baked for the following night's dinner and I placed the remaining Sauerkraut in the freezer to be used for dinner another time. Spray the bottom of a dutch oven with cooking spray, place over med heat and add the milk and cream. Heat to almost boiling. Whisk in 1 c of the flour and then, using a wooden spoon, cook and stir frequently for 20 minutes or until almost smooth. Remove from heat, stir in butter and salt, partially cover and let stand for an hour or longer. In a small bowl, gently whisk the egg with the yolk. Transfer the dough from the dutch oven to a large bowl of a stand mixer fitted with the paddle attachment. Add eggs and 1 c. flour mix on low until combined, continue with 2 more cups of flour, stirring until incorporated. Turn the dough onto a clean counter and knead the last 1 cup of flour into the dough by hand. Return dough to bowl and refrigerate for at least one hour or overnight. In batches, roll the dough into 1/4" thickness, leaving remaining dough refrigerated. Flour the board, rolling pin and dough as needed. Using a 3 1/2" cutter, cut rounds from the rolled dough. Add a dollop of filling in the middle of each round. Fold the round in half pinching and using a fork to seal the edges. Continue in this manner until all the dough is used. This blog contains affiliate links. Should you choose to link and purchase these items there is no cost to you and I am given a small stipend to help defray the costs of this blog. This week's Sunday Supper is brought to you by Marlene of Nosh My Way and Cindy of Cindy's Recipes and Writings. They have chosen the theme of Tropical Food for this edition and I could not be happier. Those of you who are regular readers of my blog know that one of my great joys in life is going to the Tropics for Scuba Diving. There is nothing better than coming in from a wonderful day of diving and sitting down to a fruity cocktail and local cuisine. I try to replicate this experience at home whenever we start longing for another trip. 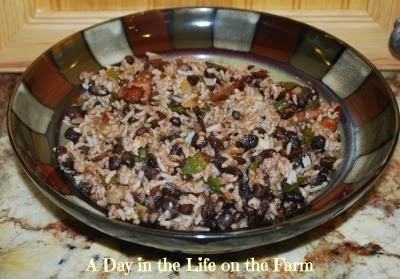 I have been making this recipe for Caribbean Black Beans with Rice for years but have never shared it before on the blog. I have no idea why not. I am more than happy that Marlene and Cindy chose this theme so that I can share it with you now. I adapted this recipe from one found in Cuisine at Home, Issue #45 from June of 2004. I told you I had been making it for years....I just hadn't realized how many years LOL. It is a complete meal in itself and can be vegan friendly if you omit the bacon, using oil, and substitute vegetable broth for the chicken broth. We are not vegan in this household so bring on the bacon!!! I normally serve it as a side dish for grilled meats....It is wonderful with ribs, jerk chicken, or pork seasoned with Island spices. Here are the other Tropical Treats being shared this week. Enjoy!! Well this April has felt more like March. I am hoping for a more seasonal May. Today is Tingting's birthday, tomorrow is Chuck's birthday and Sunday is our German son, Max's birthday. In 1976 when I had Chuck the temperatures were in the 90's. This past week we have had snow and freezing temps. On May 2, 1992 the day Frank and I were married the temps were in the high 90's. Our ice sclulptures were melting to beat the band. I will be happy if the sun is shining and the temps are warm enough for us to sit outside during the birthday get togethers for the next two weekends. This morning we took the pups all in to the doctors. They all got a clean bill of health. Tonight we are attending an appreciation dinner at the church. Once a year they have a very nice dinner to thank all of the parishioners who volunteer in any capacity. Tomorrow night, after Mass, we are going out for dinner with the Bendas. We are celebrating their Ukranian daughter, Nataly's, birthday, their 25th Wedding Anniversary, Tingting's birthday, Our 23rd Weddding Anniversary and Frank's birthday. Sunday we have people coming over to celebrate Tingting's birthday. Monday I have my annual physical and yoga in the afternoon. Last week I made it to Zumba twice, I hope to continue the trend this week. On Tuesday, Frank is giving a CPL class so I will be providing lunch for the group. I am making Lasagna and then we will have the same for dinner that night. Other than that not much on the schedule. I'll visit mom, work the food pantry, take care of Little Miss and go to choir....a typical week. What's on your schedule this week? Below you will find the Weekly Menu. 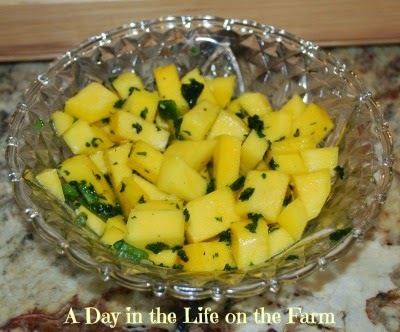 Please stop by each day for photos and recipes. I will, as always, be linking up with MPM Monday morning so stop by and see what other's have planned. This was a book that was on my wish list and that I received in a Books and Bloggers Swap back in January. I started reading this book at the end of March. I am just now finishing it. That says something about the book as it is only 185 pages and should have taken me only a day or two to read had it called to me and held my interest longer than a few minutes at a time. It wasn't that it was a bad book. It was written in letter form and illustrated with photos. The protagonist, Henrietta, is a doctor's wife who is living in England during World War II. I have been reading a lot of WWII books lately and they have been very heavy and disturbing. This showed the war from the eyes of the wealthy who lived in rural England and made much ado of the slight suffering that was suffered as compared with what was happening to the common folk in Europe during Hitler's regime. I know that this was probably a pretty true depiction of many people's experience of WWII including those of us who were safe here in the USA and whose biggest burden was having our loved one's away from home and in harm's way. We, I imagine, also felt burdened by the shortages caused by the war and frustrated at how litttle we, at home, were able to help in the effort to stop the madness that was Hitler. Henrietta was flighty and inane in her writings but you got the impression that she was much deeeper than she was willing to let on in her letters and that her writings were meant to be more of a distraction for her friend who was away at battle. Some of her drawings and prose had me laughing out loud. Perhaps the problem wasn't so much the novel as it was my frame of mind. I would be very interested in hearing other's opinions on this book. Have you read it? What did you think? 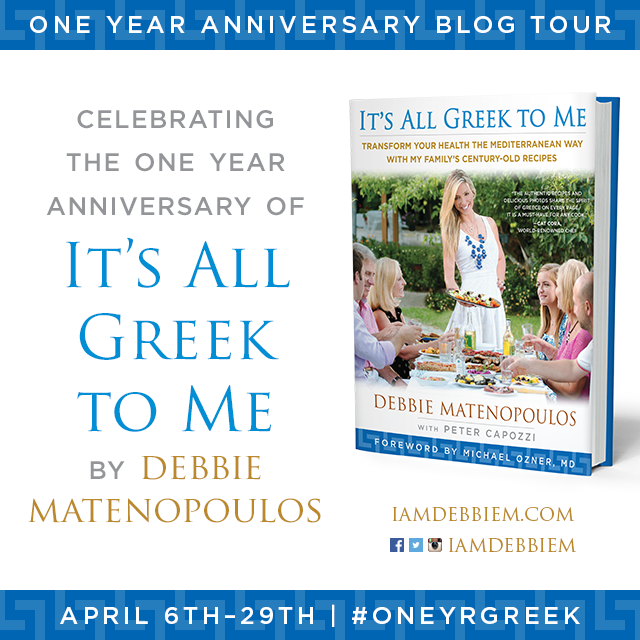 BenBella Books was generous enough to offer me a copy of "It's all Greek to Me" by Debbie Matenopoulos to raffle off last week. This morning the winner was randomly generated from those who entered and I am happy to announce the winner......Lisa Bontsas. Congratulations, Lisa! Please keep your eyes open for an email from me. This blog contain an affiliate link. Should you choose to link and purchase this item there is no cost to you and I am given a small stipend to help defray the costs of this blog. I responded to an SOS put out by the hosts of the Sunday Supper Movement and Weekday Supper Movement to post today for a blogger who was unexpectedly unable to do her post. 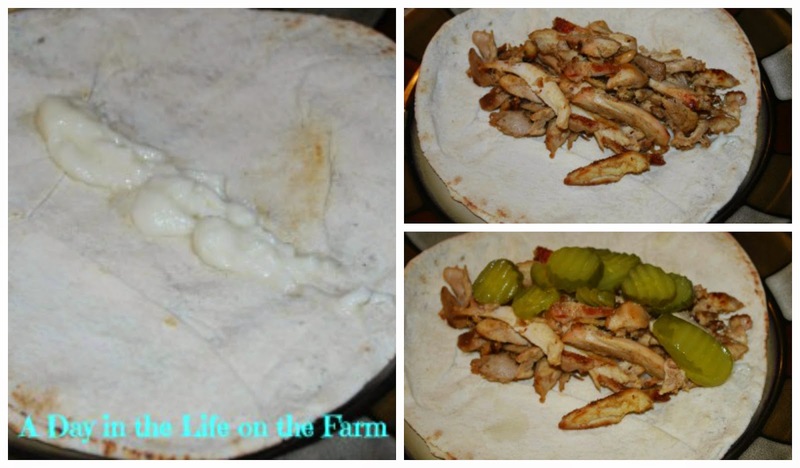 The theme for this weeks #WeekdaySupper was wraps...and fortunately I was planning on making Chicken Shwarma this week anyway because last Sunday was National Garlic Day and I had made Lebanese Garlic Paste. This is the first time I will be contributing to Weekday Supper. I normally contribute to #SundaySupper with recipes that are relaxed, leisurely and shared around the table with family and friends as we catch up with each other after a hectic week. Weekday Suppers are a little different. They are usually grabbed whenever we can all get together and often rushed because someone has somewhere to be. They can't be time consuming unless they were thrown into a crockpot and then they can cook all day so when you walk in the door they are ready. Normally, our Weekday Suppers can be put together, cooked and on the table in less than an hour. 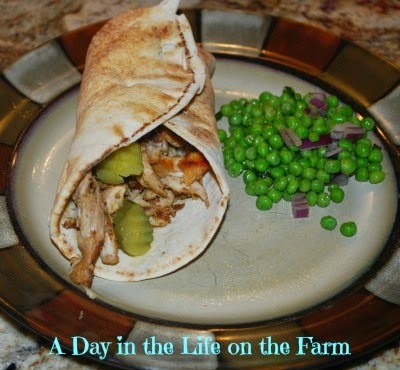 This Chicken Shwarma wrap, that I adapted from a recipe found in the newspaper many moons ago, is perfect for that. Unfortunately, I no longer have the recipe and have no idea who the original author was for this dish. You just toss all the marinade ingredients into a sealable plastic bag. Wash your chicken and place it in the bag with the marinade. You can throw it in the marinade the night before or in the morning before you leave the house. When you get home it is just a matter of throwing the chicken in the oven to roast as you pour yourselves a glass of wine and breathe for a moment before putting the sandwiches together. When the chicken is cooked through, slice it up into bite size pieces and you are ready to go. You simply warm your bread and apply the toppings. Start with some Garlic Sauce, top that with the chicken and sprinkle it with dill chips. Roll it up into a wrap and enjoy. I served our sandwiches with a Spring Pea and Mint Salad to round out the meal. Combine lemon juice, oil, garlic and spices in a large, resealable plastic bag and shake to combine. Wash chicken and add to the bag with the marinade, removing the air so that all the chicken is covered with marinade. Place bag in refrigerator overnight or for at least 3 hours. Preheat oven to 425*. Spray a baking sheet with cooking spray. Add the onion to the bag with the chicken and shake to coat. 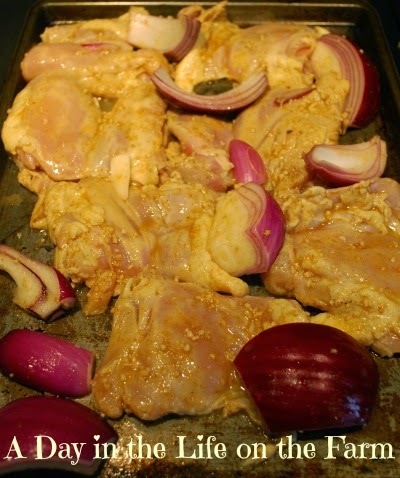 Place chicken thighs and onions on prepared baking sheet. Discard remaining marinade. Bake chicken for 30-40 minutes until browned and cooked through. Remove from oven and slice into bits. Set aside. Here is a listing of some other wonderful meals you can serve on those busy weekdays. Be sure to stop by and take a look! It is a cold, rainy, blustery day here in Michigan.....I am soooooooooo ready for Spring. It seems we have one nice day and then a week of crap before we get another nice day. I don't know how to dress when I get up in the morning. On other news front, Frank is healing up nicely after his little surgery and is nearly back to normal. He has decided to let go of our lawn service so yesterday we went out and bought him a new zero turn tractor. It is being delivered tomorrow. 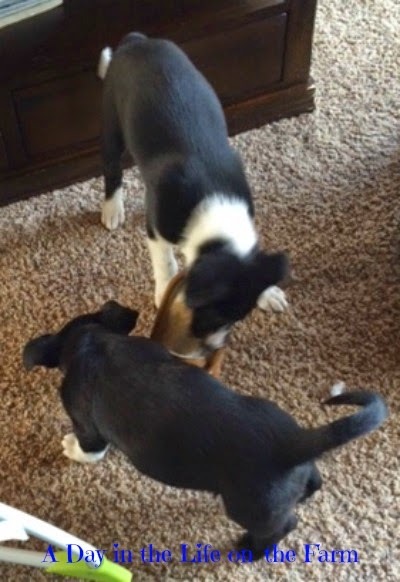 The puppies are getting bigger and, like brothers do, fight and wrestle constantly. They make us laugh and they make us scream in frustration. Well, that's been my day. How was yours? The weather isn't the greatest here in Michigan but it is much better than it has been so I declared that it was time to start acting like it was Spring and break out the grill. That means that food gets a little lighter, less sauces and gravies, less braising and roasting and more salads, veggies and grilled meats. 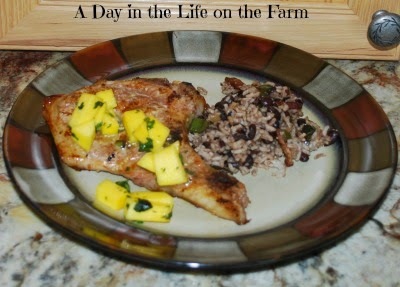 Saturday, we grilled some Carribean Spiced Pork Chops and topped them with some Mango Mojo Salsa. I adapted this recipe from one that I found in Cuisine at Home back in 2004. The recipe calls for Pork Tenderloin and I have used Tenderloin in the past with great results but Saturday I used bone in Pork Chops and they turned out lovely as well. I have also used boneless pork chops and I'm sure this rub would be delicious on ribs too. Combine all ingredients in a small container. Rub the pork chops on both sides with the Island Rub. Save the remainder for another day. This fun party is hosted by Dawn of Spatulas on Parade. Each month she gives us two lists of ingredients and then we vote on which ingredients we want to use to make a dish of some sort. This month the winners were Parsnips and Cardamom. We would love for you to join us...just send an email to Dawn at spatulasonparade@gmail.com and she will set you up. I had voted for cabbage and candied ginger for this month's challenge, thinking I would make something Asian....but I lost. So I was faced with Parsnips and Cardamom. Parsnips used to be called white carrots by my kids and the name stuck. That made me think of what I would do had I been assigned carrots and Cardamom and my mind went right to carrot cake. Sounded good to me. I was not really familiar with Cardamom, having never used it before. So I did a google search and found that it is an Indian spice describes as pungent and warm. Google also included some cardamom recipes so I started browsing them and found a recipe by Martha Stewart that called for Parsnips and Cardamom. That sealed the deal for me. Now, you know the difference between muffins and cupcakes right? That's right.....frosting. 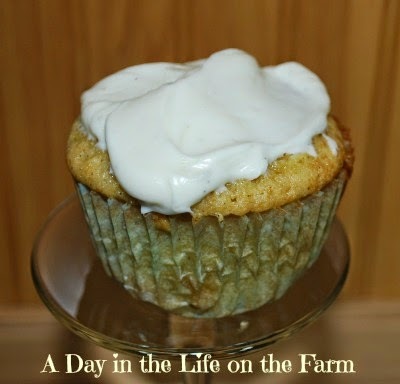 I personally prefer muffins because I am not a frosting lover but my family prefers cupcakes so I added the cream cheese frosting that was included in Martha's recipe to these. The cupcakes turned out beautifully moist and flavorful. My husband couldn't believe it when I told him that it contained parsnips. This is definitely a cupcake recipe I will use again. Tingting ate 2 of them, one right after the other. In large bowl of stand mixer fitted with whisk attachment, combine the brown sugar, eggs, vanilla, oil and parsnip. Add the flour, cardamom, baking powder and salt. Mix on low speed just until combined. Divide batter among a 12 muffin pan lined with baking cups. Bake in a preheated 350* oven for 18-20 minutes or until a skewer inserted comes out clean. Let cool completely. 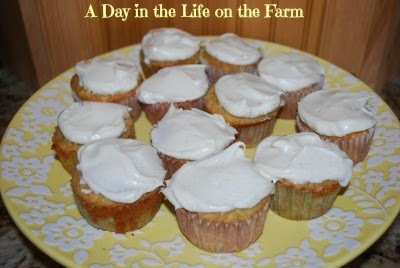 Serve as is and call them muffins or add a cream cheese frosting and call them cupcakes.